Besides the comparatively long coherence and spin-lattice relaxation times, one property that separates NV centers from other paramagnetic systems is the ability to efficiently induce almost complete spin polarization under ambient conditions and without the need for a strong magnetic field. We contrast this property with the equilibrium, room temperature polarization of electronic spins — of order 3×10-2 (3×10-4) in a 10 T (0.1 T) magnet — and of nuclear spins — between 3 to 4 orders of magnitude lower depending on the particular spin species. The latter is a fundamental limitation impacting all areas — spanning chemistry, biology, and material sciences — where NMR is used as an analytical tool. Near-complete dynamic polarization of 14N spins in diamond at room temperature. (a) NV-14N energy diagram (top) and pulse sequence (bottom) articulating pulses of laser light (green), microwave (red) and radio-frequency (blue). (b) NV ODMR spectra after application of the sequence in (a) at various magnetic fields, both for single NVs (cases (i) and (iii)) and ensenbles (case (ii)). Comparison of the relative amplitudes in the triplet yields a 14N spin polarization near to 80%. (c) The protocol can be applied recursively to compensate for pulse errors. 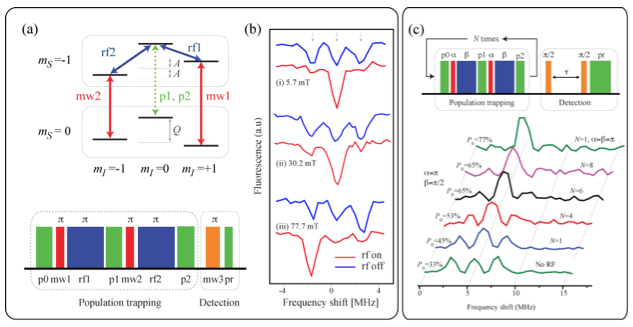 The image shows observed NV spectra upon N repeats after purposely setting the mw pulse to half the ideal value; at N=4 the 14N spin polarization converges to the ‘error-free’ case.From Pagliero et al., Appl. Phys. Lett., 2014. To circumvent this problem we are developing methodologies aimed at transferring the NV polarization to nuclear spins either in the NV vicinity or to spins outside the diamond matrix. One example in the first category is shown in the figure above where we demonstrate room temperature hyperpolarization of 14N spins at arbitrary magnetic field (Pagliero et al., Appl. Phys. Lett., 2014). Another example is our recent demonstration of polarization transfer to P1 centers (i.e., substitutional nitrogen) and surface paramagnetic defects in diamond nanocrystals (Laraoui et al, ACS Nano, 2013). A first step aimed at creating nuclear spin order in arbitrary fluids is presented in the figure below where we introduce and numerically analyze the effect of shallow, dynamically-pumped NVs on the polarization of nuclear spin species in contact with the diamond surface (Abrams et al., Nano Letters, 2014). Ongoing work aims to realize these ideas via the use of diamond structures embedded within optofluidic chips. Polarization of nuclear spin adsorbed on the surface of a diamond crystal hosting optically pumped NVs. (Main) Net polarization coupling constant as a function of NV depth for three different surfaces. In all cases the surface roughness is about 5 nm but the roughness spectral density varies from one to the other. Optimum nuclear spin polarization is attained on the surface exhibiting the smallest (nm size) features. 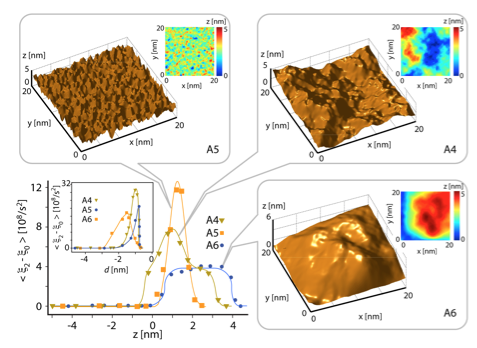 See Abrams et al., Nano Letters, 2014.